Rosewood Naturals Coneflower offers small animals a delicious treat that also acts to improve digestion as well as support your pet's immune system. This healthy snack is free from unnecessary bulking ingredients and instead bursting with healthy vegetables, seeds and herbs. 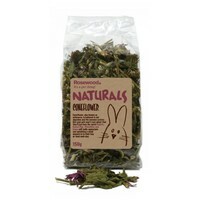 Boredom Breaker Naturals Coneflower offers small animals a wholesome snack they will love you for! Echinacea leaves, flowers and stalks.